Offering you a complete choice of products which include inline homogenizer mixer. In Inline Homogenizer, the possibility of materials – Liquid or Solid passing through it, without subjected to intense hydraulic and mechanical shear actions is zero. Here suction pipe (inlet pipe) is centrally mounted & outlet is radially mounted , therefore it is physically impossible for any material to pass from inlet to outlet without exposed to agitation. •Design is cGMP with all contact parts AISI 316. •Capacity up to 5,000 liters. 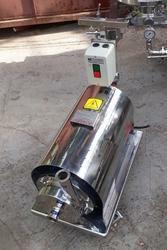 •Energy savings when compared with in-tank mixers, colloid mills and homogenizers. •Improved product quality and shelf-life stability. •Trolley mounted, with PU Wheels and support for easy handling. •Different type of stator (Coarse/Medium/Fine) for specific Particle size reduction. •Variable Frequency can also be provided. •Pharmaceuticals – Making of Medicinal Formulation ,Suspension ,Syrup ,Ointment Etc. •Food Industry : Making Purees, Pastes, Granulation etc. •Cosmetic Industry : Making Creams,Suspension Etc. •Bio-Technology – Making of Granulation ,Suspension ,Colloidal Solution Etc.